This is a collection of personal essays written by children. Tough topics like death, disability, and issues at school are examined in creative, thought-provoking ways. They can be used as models for your own students' writing. This is a collection of essays written by some of the most well-known children's authors. Persuasive, personal, graphic, and informative formats are all represented. Some are laugh-out-loud funny, while others take a more serious turn. It is an excellent resource for students who never say essay without saying boring first! This book by Jock Mackenzie is most suitable as a teacher resource. He includes activities for teaching every part of an essay, from pre-writing to publishing. 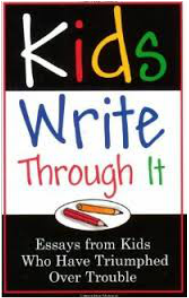 The book is for upper elementary, but some activities could be adapted for younger writers. Graves, one of the most respected researchers and teachers of writing in the classroom, offers a wealth of ideas in this book. This is definitely a mentor text for teachers, not students, but one worthy of your shelf. An appendix in this book features Theodore Geisel's first drafts of "Hooray for Diffendoofer Day!" The book was actually completed posthumously by Jack Prelutsky and Lane Smith, who used these drafts as the framework of the story. Lynne Truss captures the dangers of misplaced commas in this witty book. Each spread features the same sentence but the commas are in different places. The illustrations show how the meanings are consequently altered. 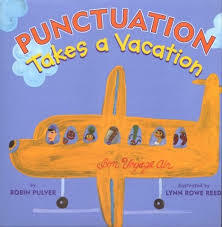 Robin Pulver tells the tale of Mr. Wright's class, who lets punctuation leave for a day. Mayhem ensues and the students borrow punctuation from another class to plead for theirs to return. The end of the book features a quick guide to the types and purposes of punctuation. This is one book from a series called Words are Categorical by Brian P. Cleary. 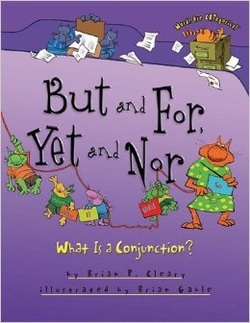 Each book features a different convention and plenty of examples in a silly, rhythmic style. Your students have a topic, but now what? Where do they begin? Writing an entire essay can be a formidable task for some young authors. In this activity, students will create a scattergram to break their essays into manageable chunks. The final product also lends itself to further instruction about transitions--where and how they fit into the essay. Write the topic in the middle of a piece of paper. Take 5-10 minutes to jot down everything you know about the topic. Don't think too hard about this step! Using different color pens or shapes (circles, boxes, triangles, squiggles), begin to group words are phrases that have something in common. In the corner, create a legend so you won't forget what the colors/shapes meant! **It is okay (even great!) if you have words left over. You can cross them out or save them for a different piece of writing. We cannot always write about everything we know. Not only will it take too long, but sometimes it is not important for the purpose of the piece. Now think about the flow of your essay. Which sub-topic would make the most sense first? Second? Last? Write numbers next to your sub-topics indicating the order they should go. Hit the books! If necessary, build on the ideas you wrote down so you will have enough to write about. Use the following activity after brainstorming or researching a topic for any type of essay. Prior to this activity, students should write each piece of information they plan to include in their essay on an index card. Model: Sort a stack of research cards by theme using a think aloud and/or student input. Once sorted, assign a title to each category. Write each title on the back of an envelope. Determine in which order the categories should be written. Glue the front of the envelopes onto the file folder accordingly. Students will categorize their own research cards. On each envelope, they will write a number indicating the order in which the ideas will be written about in their essay. Students will confer with a partner, explaining their thinking and asking for feedback. Students will glue their envelopes onto a file folder. Mackenzie, J. (2007). Essay writing: Teaching the basics from the ground up. Portland, ME: Stenhouse. pp. 32-43. If you use a Writer's Workshop model, everybody may be working on a different stage of the writing process. You may be busy helping a student organize their essay or teaching a minilesson about adding details. Assigning student editors can free up your time, give students a wider audience for their writing, and provide students with a sense of agency. Each student editor will wear a different cap (spelling, punctuation, capitals, or whatever else you are working on). Anyone in the editing stage will know exactly who can help them. After teaching a minilesson about something you notice many students are missing in their writing, introduce the idea of peer review. Explain that our writing can be improved by having a fresh set of eyes looking at it and providing feedback. If using peer review for editing, share a chart with the symbols that everyone must use so the class can share a common language. An example can be found on the right. Otherwise, explain and model what you expect students to look for and do when reading their peers' work. Every student should have a piece of writing at their desk. While music is playing, students wander around the room. As soon as the music ends, students sit at the nearest desk and begin editing. When first introducing peer editing, begin with something small, like sentences. Focus on only a few things at a time. It is overwhelming for many students to correct everything at once. Before starting, students could write one area of need, like spelling, at the top of their paper. When a student sits before a paper, their editing focus will be on spelling. 1. Give each student 3 or 4 different colored highlighters. 2. Assign each color to a different part of the essay. 3. Each student will highlight their essay using the color code. 4. After completing the highlighting, students should notice if anything needs to be added, deleted, or made more clear. Mackenzie, J. (2007). 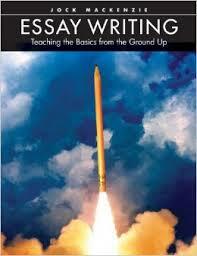 Essay writing: Teaching the basics from the ground up. Portland, ME: Stenhouse. 4. With guidance and support form adults, produce writing in which the development and organization are appropriate to task and purpose. 5. With guidance and support from peers and adults, develop and strengthen writing as needed by planning, revising, and editing. 4. Produce clear and coherent writing in which the development and organization are appropriate to task, purpose, and audience. 5. With guidance and support from peers and adults, develop and strength writing as needed by planning, revising, editing, rewriting, or trying a new approach. 8. Recall information from experiences or gather information from print and digital sources; take brief notes on sources and sort evidence into provided categories. 8. Recall relevant information from experiences or gather relevant information form print and digital sources; summarize or paraphrase information in notes and finished work, and provide a list of sources.